We’d love your help. Let us know what’s wrong with this preview of The Braille Killer by Daniel Kuhnley. How can you catch what you can’t see? Blind at birth, Alice Bergman’s sight has been restored—but her childhood struggles and the assault she endured have never been forgotten. For the last ten years, she’s been secretly receiving letters from her attacker–letters written in Braille. Now a homicide detective, Alice is assigned a murder case. The victim? A blind girl. The sce How can you catch what you can’t see? Now a homicide detective, Alice is assigned a murder case. The victim? A blind girl. The scene is preternaturally clean, far more than can be explained in any rational way. Alice is able to relive the girl’s last moments–but she can’t see the girl’s killer. That doesn’t matter, though. Alice knows the killer is the same person who attacked her as a teen. When another girl is murdered, Alice herself becomes a suspect due to grisly evidence at the murder scene. When the stress of the case and the trauma of her past combine to bring on the same blindness she faced as a child, Alice must struggle in the dark to catch the killer and regain her sight before the Braille Killer strikes again–this time, much closer to home. To ask other readers questions about The Braille Killer, please sign up. I was not sure what to expect when I started reading The Braille Killer, one of the Amazon Kindle Unlimited selections that caught my eye. A super twisty, supernatural murder mystery would be a good way to describe it. The Braille Killer is more than that... the characters are developing as the writing unfolds, and the darkness that surrounds Alice builds as the novel progresses. It is interesting how the mystery builds on the paranormal activities that Alice uncovers and tries to keep secret. 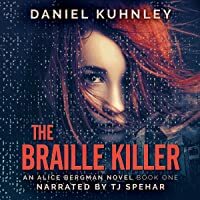 I I was not sure what to expect when I started reading The Braille Killer, one of the Amazon Kindle Unlimited selections that caught my eye. A super twisty, supernatural murder mystery would be a good way to describe it. The Braille Killer is more than that... the characters are developing as the writing unfolds, and the darkness that surrounds Alice builds as the novel progresses. It is interesting how the mystery builds on the paranormal activities that Alice uncovers and tries to keep secret. I like that the themes of secrets and forgiveness are explored throughout Alice's journey, and I love the Alice in Wonderland references too. Alice has a quirky, fun sense of humor that is evident in author Daniel Kuhnley's writing. 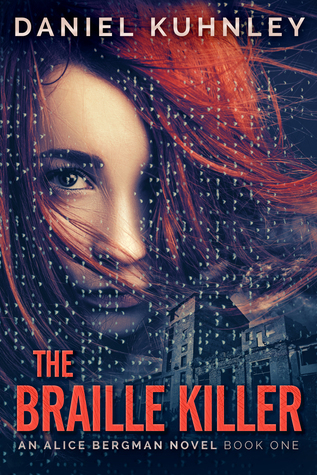 The Braille Killer is a dark and suspenseful mystery that will take you down a rabbit hole filled with twists, turns, and thrills of the supernatural variety. Alice Bergman is a cop who has a past that has literally never left her. Over the past ten years she has been periodically contacted by a twisted criminal who communicates with her through a writing system that few could recognize – braille. Alice has been a silent victim, keeping her tormentor’s contact and demands a secret from all those The Braille Killer is a dark and suspenseful mystery that will take you down a rabbit hole filled with twists, turns, and thrills of the supernatural variety. Alice Bergman is a cop who has a past that has literally never left her. Over the past ten years she has been periodically contacted by a twisted criminal who communicates with her through a writing system that few could recognize – braille. Alice has been a silent victim, keeping her tormentor’s contact and demands a secret from all those that know her. That is until the recent murders that occurred which are too reminiscent of a past that Alice would do anything to forget. She knows that her tormentor is sending a message and she has to finally put a stop to it before more girls lose their lives. I was expecting a grisly whodunit when I picked up The Braille Killer but this story is truly a notch above what I was ever expecting. The writing portrays every scene in vivid detail and, trust me, some scenes can be quite graphic. The characters in this story are all quite interesting and add much to the plot but Alice is definitely the star. She will infuriate you, invigorate you, and get so under your skin that you can’t help but have to know how her story plays out. There were some parts of this story that I felt weren’t quite realistic enough for me to believe, and I am not referring to the paranormal parts, more about the choices that Alice herself made. It would take me out of the story for a bit because I would be pondering what occurred instead of just being able to go with it. Overall though, I found The Braille Killer to be the kind of chilling thriller that left me feeling like I needed to keep the lights on just a bit longer at night! This review is based on a complimentary book I received from Author, Daniel Kuhnley. It is an honest and voluntary review. The complimentary receipt of it in no way affected my review or rating. An absolutely masterful blend of thriller-mystery-paranormal suspense! I truly enjoyed this unique story! It has so many unexpected elements that I loved. Kuhnley is a masterful story-teller with an amazing ability to throw the reader directly into a story and keep them there until the very last page. Readers are hooked on an emotional level thanks to characters that are well-crafted and fleshed out in a very relatable way. I also enjoy that even though this story is full of chills, thrills, and An absolutely masterful blend of thriller-mystery-paranormal suspense! I truly enjoyed this unique story! It has so many unexpected elements that I loved. Kuhnley is a masterful story-teller with an amazing ability to throw the reader directly into a story and keep them there until the very last page. Readers are hooked on an emotional level thanks to characters that are well-crafted and fleshed out in a very relatable way. I also enjoy that even though this story is full of chills, thrills, and darkness there are also well-timed moments when the writer's wonderful sense of humor shines through. His timing is superb. I've enjoyed his fantasy series so much that I wasn't sure what to expect with this thriller. Let's just say, Daniel Kuhnley can write dark and twisted just as epically as he can fantasy. Maybe even more so. It takes a lot to creep me out, but I was sufficiently creeped out by the villain living in the dark corners of every page of this novel. I'll never look at garlic-pickles the same way again! I look forward to reading more of these Alice Bergman stories! I was not sure what to think when I started reading this book. Normally I am into the fantasy style stories instead of the modern day ones. Having read the author's(Daniel Kuhnley) other books, I figured I would give this a try. I was rather surprised at how fast I was pulled into the story and the characters. The twists and turns that are uncovered in this are set up really well and the pace of the mystery never let up. Overall really well done. Looking forward to another in this story line. This book is such an amazing mix of mystery, supernatural and action all rolled into a story that will keep you on the edge of your seat. Daniel has a wonderful way of pulling you into the story early on and describing people, places and events so vividly you can picture it in your mind. I would most definitely recommend this book! I really enjoyed reading this book! Very suspenseful!! I couldn’t wait to turn the page! I definitely recommend this book! The Braille Killer is available now! Read the FREE prequel novella to The Braille Killer, Birth Of A Killer . You can also read my new novella, Scourge , for FREE as well! I'm Daniel Kuhnley, an American author of dark fantasy and mystery thrillers. My novels include Dark Lament, Reborn, and The Braille Killer. I enjoy watching movies, reading novels, and programming. I live in Albuquerque, N The Braille Killer is available now! I'm Daniel Kuhnley, an American author of dark fantasy and mystery thrillers. My novels include Dark Lament, Reborn, and The Braille Killer. I enjoy watching movies, reading novels, and programming. I live in Albuquerque, NM with my wife. My stories feature strong male and female characters that you’ll connect to and identify with. Both heroes and villains conquer adversity in their quests. Evil runs rampant in the dark worlds I portray, but the heroes provide glimmers of hope. My novels are geared toward adult readers. There are several threads of romance and some sexual encounters but nothing explicit. They also contain some mild language but nothing vulgar. All of my novels are professionally edited and proofread to ensure you have an enjoyable reading experience. More information about my novels and sample chapters are available at danielkuhnley.com.